Update: People have already started digging around in the new Android P beta, finding layout changes in the process. Google’s Android P beta just got more expressive in 157 ways thanks to the launch of the confusingly named Developer Preview 3 (Beta 2) today. It includes 157 new (and modified) emoji, as well as including final APIs, latest system images and updated tools for developers. Google’s update is meant to encourage developers to make use of features like Adaptive Battery, and App Actions and App Slices shortcuts. And while not specifically announced, there are also other small changes that users are beginning to spot, such as slight layout tweaks to the Night Light and Security screens, the app switcher UI, and the placement of the date in the notifications bar, all of which were highlighted by DroidLife. The original Android P preview is just four months old and works with the Pixel 2, Pixel 2 XL, OnePlus 6, and five other smartphones (with more planned to launch P betas). With beta 2 already out, Google is on schedule with its "later this summer” release date (in the past that has meant August). Sure, better battery life and app shortcuts are major Android P features. However, emoji seems to be just as popular these days. 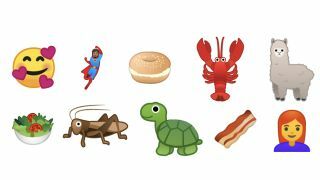 Google Android P beta 2 seems to be a small, but healthy update that properly cooks bacon, discards the egg from salad, and continues to add diversity to existing emoji. You can update to Android P beta 2 today over-the-air if you already have Android P beta 1 installed. If your device qualifies, you can enroll in the beta and skip straight to the latest beta.